Mathematics is a powerful language. Learn how to use it to communicate with others. A minor in mathematics will provide you with a set of quantitative and analytical skills applicable across disciplines, careers and everyday life. Learn how to investigate and model the world around you. The minor can be combined with any major. 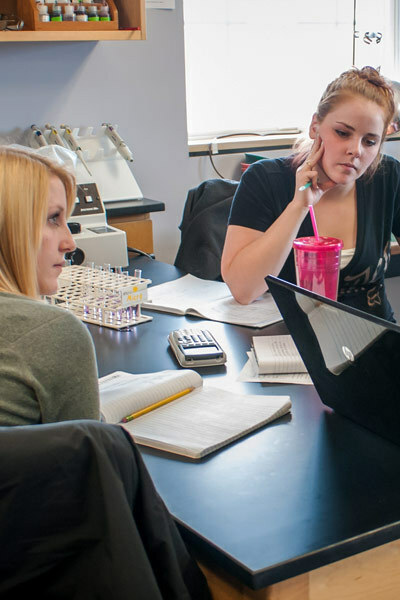 The Mathematics Program plays an integral part in Colby-Sawyer’s efforts to ensure that students attain proficiency in quantitative literacy as an important element of their liberal education. The math courses are supplemented by a college-wide program to teach quantitative literacy across the curriculum. Placement into mathematics courses is based on a student’s intended major and performance in high school math courses. For the purpose of placement, students should have successfully completed high school math courses with a grade of B- or better.